Data Protection is one of the most integral parts of the Enterprise Storage Industry. Replication plays an important role in Business Continuity. In this article we will discuss how replication technology helps in achieving data protection and disaster recovery. Replication is defined as replication of data from source to destination. Replication helps us to achieve business continuity. RPO ( Recovery Point Objective): RPO refers to the point in time to which services are restored and recovered. So if RPO is zero it corresponds to no data loss. RTO ( Recovery Time Objective): RTO refers to how long it takes to get an application or service up in running state. If RTO is zero there is no downtime. Whenever Service Level agreements are signed between storage vendors and customers it mentions RPO and RTO for the storage appliance. There are two types of Replications, Synchronous Replication and Asynchronous Replication. In Synchronous Replication, production site and disaster recovery site (target) are always in sync. RPO for Synchronous Replication is zero. 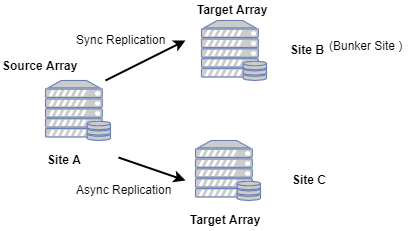 Synchronous Replication works best where both source and target are in the same data center. In an Asynchronous Replication Solution, RPO is 15 minutes to a few hours. There is no specific distance limitation. Asynchronous Replication solution is less expensive than a synchronous solution. 1. Three-Site Cascade: Arrays at source and target do not communicate directly. If there is a large scale disaster you lose both source and bunker site. 2. Three Site Multi-target: Here source arrays simultaneously replicate to two target arrays. Source array has visibility to both the arrays and replicate to both the target arrays without relying on bunker site. In case the source site is lost both surviving targets cannot communicate with each other. 3. Three-Site Triangle: There is an existence of additional replication link between the two target arrays in sites B and site C. This additional link helps to replicate between surviving targets in case source target is lost. Three-Site triangle overcomes disadvantages of Three Site Multitarget. There are several advantages of Disaster Recovery. In the case of disasters which could be either man-made or natural disasters, data would be still accessible with the help of Disaster Recovery. .So there would be no data loss and hence no financial losses to organizations. Your data is replicated to some other geographical location and it is still accessible to you. Quality Assurance for Storage Appliance supporting replication technology is an important aspect. Various use cases which could be covered while doing QA for replication are integrity for source and target array. Ability of replication policy and schedules to cope up with failures could be tested . Application awareness in replication could be covered for vendors. RPO and RTO could be calculated which could be shared with customers as disaster recovery report. At MSys we have expertise for Disaster Recovery Solutions. MSys could add value to your business by helping you to build disaster recovery solutions and performing quality assurance for your Disaster Recovery Solution.